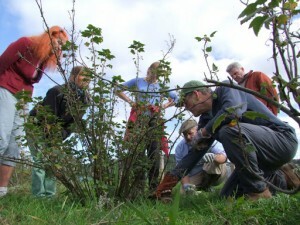 Comrie Community Orchard – Come and Help on Sunday ! It’s one of our regular monthly workdays and there’s plenty to do. Don’t feel you have to come for the whole day. Even an hour helps us and helps you to get plenty of fresh air and exercise, but for those who can give more time, workdays run from 11.00 – 15.00. If you would like to come along, please wear clothing appropriate for all weathers and sturdy boots. Gardening gloves are also helpful. There is also a break for lunch. If it’s good weather we’ll have our picnic outside at the picnic table. If not, we’ll cosy up in the Shepherd’s Hut, so please bring refreshments. The main task is in the open orchard, where we are applying compost with a little manure to each of the trees, then placing substantial pieces of cardboard on the ground round the tree bases. This is covered in partially rotted bark. The idea is to suppress weed growth, a necessary precaution for young trees. • All the trees need checking for rabbit and hare damage, and extra protection added to them if necessary. • It is the time of year to apply a winter wash to help protect the trees from over-wintering pests. • There are some wild flower plugs to plant, foxglove, mullein and ragged robin, and some seeds to sow, such as borage, to attract bees to the beetle bank. Not sure where the orchard is or what it’s all about? Come to Cultybraggan Camp, where a warm welcome awaits and we’ll try to enlighten you. This is Comrie’s Orchard in the making! Let’s hope for a kind Spring to bring lots of blossom and the promise of fruit to come!